The Cellsafe(r) Radi Chip(tm) patent pending technology has been developed by an Australian RF Engineer. Radi-Chips consist of multiple layers of specially formulated microwave absorbing materials, combined with a specially engineered passive directional RF coupler. These layers absorb most of the transmitted RF signal from the mobile phones antenna while the RF couplercontrols and disperses the signal towards the back of the phone. Devices which claim to act as ‘shields’ may significantly interfere with the normal operation of the phone. Reduced or redirected transmission levels caused by such shielding products can interfere with call reception and quality and may also cause calls to drop out. The Radi Chip technology has been scientifically tested and proven not to interfere with the transmission signal or with call reception, unlike these ‘shielding’ devices. All of this is designed to achieve a better result than just keeping the phone away from users head or body (as recommended by the manufacturers). The Cellsafe(r) technology reduces SAR (Specific Absorption Rate) up to 95% * and will not interfere with transmission signal or call reception. 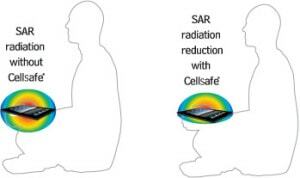 Now you can experience the peace of mind of Cellsafe(r)’s scientifically proven mobile phone radiation reducing technology in a whole new way. Enjoy the freedom to choose your own mobile phone case. This discreet chip is placed on the back of your phone and at just 0.35mm is thin enough to allow fitting of any mobile phone case over the top. The Radi Chip(tm) can also be used on your mobile phone without a case. (* refer to test results page for individual results according to phone make & frequency band). 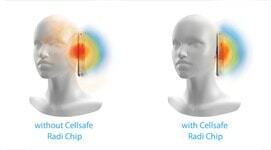 The Cellsafe(r) Radi Chip(tm) patent pending technology has been developed by an Australian RF Engineer. Radi-Chips consist of multiple layers of specially formulated microwave absorbing materials, combined with a specially engineered passive directional RF coupler. These layers absorb most of the transmitted RF signal from the iPads phones antennas while the RF directional coupler controls and disperses the signal towards the front of the iPad. The iPad chip works as a mirror effect: The iPad antenna sends the signal 360 degrees, when applying the Radi-ChipTM the signal which would have goneto the back of the iPad is then redirected to the front of the device. Much like a light beam directed towards a mirror reflects the light back. All of this is designed to minimise your exposure to radiation as recommended by the manufacturers who advise you to keep the device away from your body. 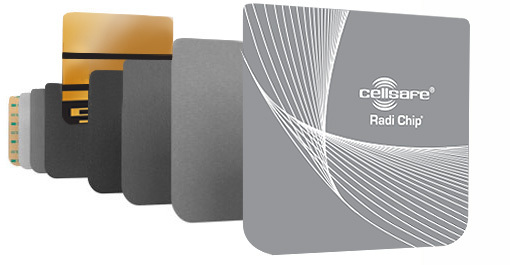 The Cellsafe(r) technology reduces SAR (Specific Absorption Rate) up to 65%* (for Wi-Fi – bottom chips) & 87.7%* (3G / 4G – Top Chips) and will not interfere with transmission signal. Now you can experience the peace of mind of Cellsafe(r)’s scientifically proven radiation reducing technology in a whole new way. Enjoy the freedom to choose your own iPad case*. These discreet chips are placed on the back of your iPad and at just 0.35mm are thin enough to allow fitting of any iPad case over the top. The Radi Chip(tm) can also be used on your iPad without a case. (* Refer to test results page for individual results according to iPad model & frequency band).